We recently had a friend who works in the renovation business come to town to help us kick off our home improvement projects. We prepped all week building our wishlist, and removing our 15 radiators shot to the top. 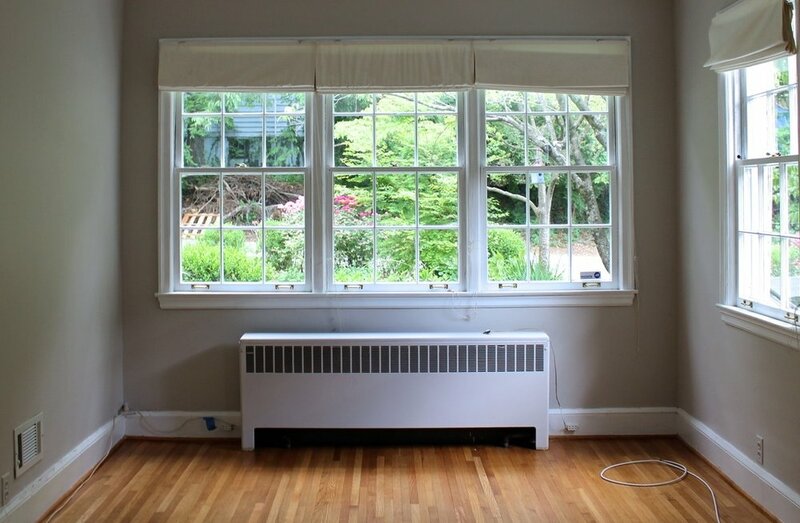 Central air and heating was installed by the previous owner a few years ago, but the radiators had been left in the house for “character.” Truth be told, I bought it and loved the uniqueness they brought to the house with the custom wood and wire coverings. Once we moved in we really wanted the space they were taking up, so decided they needed to go. Friday our guest started early and by noon he had all 15 radiators demo-ed and lugged off to the scrap yard! AMAZING! One really cool thing about is the house is that the previous owner still had some of the original blue prints and the original plan for adding the radiator heat back in 1948! So you can imagine what we uncovered...nearly 60 years of yuck. I love projects and the satisfaction once you've complete them, so this was a dream come true. My job was to make the walls look like there hadn't been radiators covering the wall for the last half of a century. The perfect making for a shocking before and after! I had never repaired a wall before and wasn't quite sure where to start. Surprisingly, it was easier to do that I thought but time consuming. First things first, we assessed the walls to see what kind of work was needed. None of the walls had any holes going all the way through the drywall, so we just needed to repaint the chipped places in the wall and repaint. If you're repairing any wall it will need to be cleaned. This gets the grime and dirt off of it to make your paint stick beautifully. I used a rag and some 409 to wipe down the walls. Once the walls are clean, you'll want to use a paint scraper to remove paint that is chipping or is easily chipped off. This gets rid of the paint that has lost it's bonding, so your new paint won't crack. Picking your spackling knife should be based upon the size of you patch spots. I used about a 5" knife. You'll want to put a few scoops of spackling in your tray and mix it up especially if it's been sitting for a while. The reason you take it out of the bucket it comes in is because this stuff dries quickly and you'll just want to have an amount to work with sitting out so you don't dry up your whole supply. I used DryDex Spackling with Dry Time Indicator, which I liked because it's hot pink when wet and dries white making it really easy to monitor. On one of the flat sides get some spackling on the knife. Then press that loaded side into the wall applying pressure to the tip so the knife curves against the wall nearly coming flat. Your goal is to have the spackling on your knife fill into the hole. Then you'll take the tip of the knife and scrap past the spot to level the spackling. Do this in all spots needed and let dry. While the spackling was drying, I used ALEX Fast Dry White Acrylic Caulk to patch up the space that had opened up overtime between the wall and the baseboard. You'll cut the of the tip of the caulk at a 45 degrees angle and line the tip up to the place you are trying to fill. Apply pressure to the trigger as you move the caulk gun along the wall. Next, smooth the caulk with your rag being sure not to apply too much pressure to the middle. You are just trying to remove any excess. This video is a great reference. Let the caulk dry for at least 20 minutes more time will be required it you don't use fast drying. Once your spackling and caulk are dry (won't be squishy to the touch), you will take a low grade hand sander block and run it over the wall in a circular motion. You are just leveling out the spackling and giving the wall a smooth finish. Once you're done when you run your hand over the wall should be smooth. Remove any residue created with a vacuum or rag. Use blue painters tape to cover the trim so you do not get paint on your trim/baseboard. Pour your desired paint color into your painters tray, apply paint to your roller running it back and forth in the tray a few times. Roll the paint onto the wall in an up and down motion spreading the paint evenly. I applied two coats. Once the wall paint is dry, tape up the wall at the top of the base board and on the floor to block those places from unwanted paint when you paint the trim. Use the desired paint color and a trim brush to apply the color using a left to right sweeping motion. Make sure to apply even pressure here and smooth the paint out evenly so you don't get unwanted brush marks. Allow paint to dry in-between coats. I applied two coats here as well. Once dry, remove blue tape and you're done! Such a big difference from where we started to the finished wall! We still need an electrician to come switch out our old wiring, but what a difference!